Wash dal thoroughly and pressure cook it with carrot and potato for 3 to 4 whistles. Meanwhile fry 1 tea spoon urad dal, fenugreek seeds, red chillies, coriander seeds, grated coconut and curry leaves one by one till light brown and fragrant. Grind the fried spices into fine paste. Heat two table spoon oil in a pan, splutter mustard seeds, throw urad dal, asafoetida powder and green chillies. Fry for a while. Add tamarind juice and salt. Bring to boil for some time. Add cooked toor dal-vegetable mixture, ground masala and jaggery powder. Add sufficient water to get the gravy in desired consistency. Mix well and cook covered on low flame. 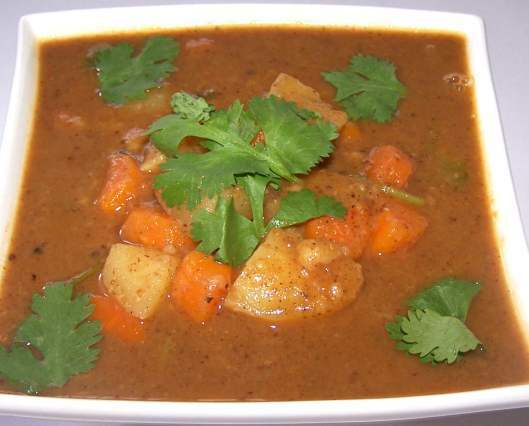 Once the sambar is ready sprinkle some coriander leaves and serve.